James Hickman and Dan Cassidy | The Goose Is Out! 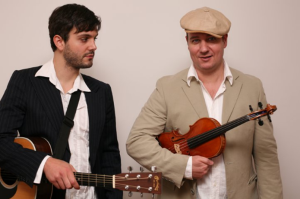 James and Dan came to the Goose in 2013 and played two storming sets of British and American music. James’ and Dan’s duo was formed in 2008, beginning with several local shows in James’ hometown of Shrewsbury and the surrounding county of Shropshire. Their relaxed banter and unique musical style was well received and they were soon performing further afield. The following year, with the prospect of more comprehensive tours ahead, they recorded and released their debut album ‘Severn Street’, which features arrangements of traditional songs and tunes and several of their own compositions. Click here to go to James and Dan’s website!